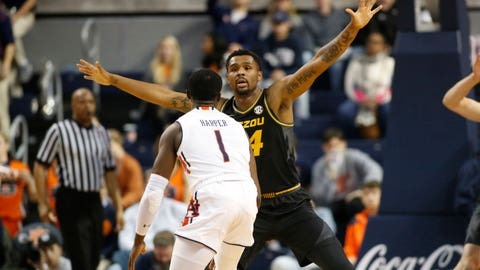 Kevin Puryear (24) guards Auburn's Jared Harper, who finished with 16 points against Missouri. AUBURN, Ala. — Samir Doughty made a quick 3-pointer to start the second half, Bryce Brown hit two more and Auburn was soaring again. “These last few games we came out the second half lackadaisical, so those 3-balls really got us going,” Okeke said. It ended with Auburn’s largest margin of victory over an SEC team at Auburn Arena, which opened for the 2010-11 season. Auburn’s offense snapped out of its funk for a 3-point flurry. Doughty and Brown hit their three 3s in a 1:15 span, to push the lead to double digits for the first time. Auburn center Austin Wiley (lower right leg) and Missouri’s Smith (ankle) both remained out with injuries. Wiley has sat out the past four games. Smith, who has missed two games in a row, leads the SEC in 3-point percentage.